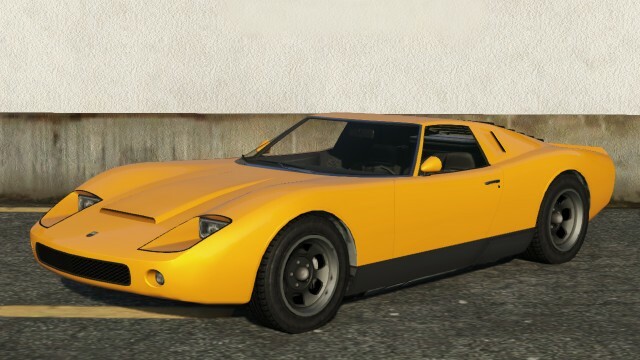 The Pegassi Monroe is a rear mid-engine sports classic car featured in GTA 5. The design of this car seems to be heavily inspired by the Lamborghini Miura with elements from the Ford GT40 for the front fascia. The tailights are derived from the Chevrolet Corvette Stingray. The sides of the Monroe do resemble the Miura though, being more flat and not having scoops. Furthermore, the hood in general looks like that of a Ford GT40. 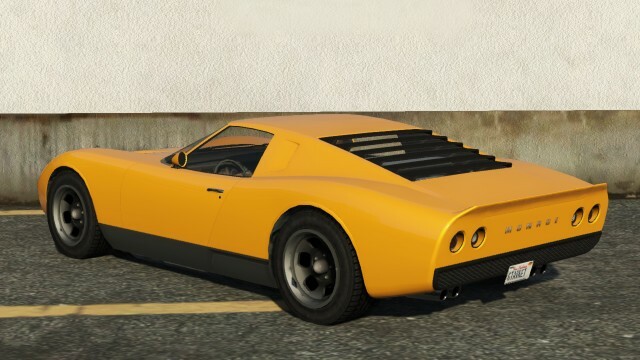 The Pegassi Monroe is one of the fastest classic cars in the game, with its speed only being matched by the JB 700, achieving about 207 mph (despite what legendarymotorsport.net states). Acceleration was once best in class (being bested by the Invetero Coquette Classic), reaching 60 mph in the 5 second range. Before the addition of the Pigalle, the Pegassi Monroe had superior braking and handling to all sports classics, but despite this, traction is still well kept. Braking was not very good even before the Pigalle, but will still stop from its top speed faster than all other non-DLC cars in its class. The tires seem to be modern high-performance tires, while the spare tire is a space-saver with wire wheels. A silver Pegassi Monroe can be found rarely driven by the Sentinel XS Driver. Can be bought from Legendarymotorsport.net for $490,000.